Our Pascale line of accessories are design with style and efficiency in mind. The construction quality of the Pascale line is among the best our there and can compliment any booth including high-end custom booths. 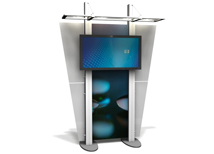 Kiosks are great as standalone media centers or as an addition to a booth space. 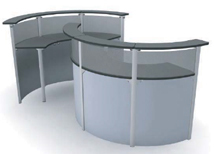 We offer multiple counters and pedestals including locking counters! Every item is made to order in the USA and includes everything needed including graphics and shipping cases! 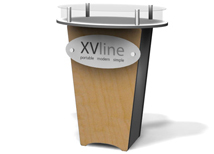 We offer four main categories of Pascale accessories including kiosks, pedestals, counters, and reception desks. All of these products are easy to assemble and can be customized to exact specifications. Every items uses US made materials and are always built to order in the USA. Custom graphic printing is included with most items to give the accessory a branded look. These accessories work great with any of our Pascale booths, but can also work in sync with any of our other trade show booths! 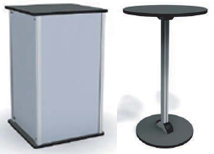 If you are looking for a quality accent for a trade show that has the ability to be customized, the Pascale line is the perfect solution!